I was one confused consumer one night last week. Late at night and hungry, I opened the freezer door to find a lone microwave dinner. "OK," I thought, "this will have to do." But then something happened that crushed my hopes of a hunger-free night. Printed on the carton was a "Use By" date, and it was now almost two month's past that date. Suddenly, visions of past problems of spinach and cookie dough danced in my head. There I was, a grown man staring at that "use by" date and thinking, "Will eating this mean a trip to the emergency room?" At least I knew that I wasn't alone. Millions of consumers experience the confusion of product dating, primarily because it is confusing. One package might have a "sell by" date, another a "best before" date, and yet another, a "use by" date. Some products even use what is called a Julian Date, which is perfectly understandable as long as you're a mathematician. It would be much easier if the U.S. Food and Drug Administration (FDA) or the U.S. Department of Agriculture (USDA) required product manufacturers to print a simple sentence on each product, maybe something like: "If you consume this product after this date, you're gonna regret it." But surprisingly, the federal government does not have a nationwide food-dating system in place. Except for infant formula and some baby food, USDA regulations do not generally require product dating. And as for the FDA, widely seen as the nation's primary enforcer of food and drug safety laws, it largely stays out of food dating. Why? "Because the expiration date is not indicative of product quality if storage conditions have been less than optimal, the FDA does not require expiration dates on most products," said Michael L. Herndon of the FDA. Herndon said that even the dates required on infant formula are "use by" dates, not "expiration" dates. In other words, almost all food dating relates to the quality of the product, not its safety. "The quality characteristics of foods (taste, aroma and appearance -- as distinct from safety characteristics) often depend in great part on good storage conditions: temperature and humidity control in the retail store and warehouse," Herndon said. Although 20 states do have regulations concerning product dating, most dates are only guidelines and strictly advisory in nature. This means that every consumer should have a basic understanding of food product dating and safety. "First, consumers need to understand that overall, when manufacturers set their shelf life for products, they are being fairly conservative in the dating," said Martin Bucknavage, Food Safety Expert at the Department of Food Science at Penn State University. However, Bucknavage suggested a few guidelines on years of testing. "Low acid products such as corn, green beans, or tuna can last a good while after the shelf life of that container. High acid canned products such as tomatoes or citrus products like grapefruit juice wont last as long due to the high acid content," Bucknavage said. With meat and poultry, eat or freeze it within two days of the purchase date, Bucknavage recommends. Additionally, pay close attention to any date listed on luncheon meat. Although the date relates primarily to quality and not safety, luncheon meat can carry an organism called listeria. This organism can slowly grow at refrigeration temperatures and can have deadly effects on people with a suppressed immune system. Eggs can last 5 weeks past the date on the carton, but only if they are stored properly. Where do many of us keep the eggs? In those little egg holders on the door -- the same door that is exposed to warm air every time we open the fridge. Much better to keep your eggs in their original carton and place the carton on a shelf in the back of your refrigerator. Your refrigerator should be kept between 33 and 40 degrees (preferably 36 degrees) and the only way to monitor accurately the temp is with a thermometer. With canned goods, it's possible the date has nothing to do with the product but everything to do with the can. "The manufacturer that made that can is only going to warranty the actual can for so long," Bucknavage pointed out. "So even if the food inside the can might last three years, if the can manufacturer warranties that can for only two years, the product expiration date will be no more than two years." Furthermore, even if the product is not outdated, there can be issues with the can. If a can is dented at a double-seam (located at the top or bottom) toss it out. Also throw it away if there is a severe dent on the side because it can pull at the top or bottom seams. Rusted cans should be tossed out. Rust can cause micro-pinholes that you cant see but that provide a handy entrance point for bacteria. If the can is swollen, get rid of it. The most common cause of swelling is high-acid contents that interact with the inside of the can and produces hydrogen gas that will cause the can to swell. Cans can also swell if the product has been stored in a location with a very high temperature. Even more alarming, swelling can be a sign of botulism -- a potentially fatal muscle-paralyzing disease caused by a toxin made by a bacterium, Clostridium botulinum. Extremely rare in commercial foods, botulism is more likely to occur in home-canned products -- something the eat-locally crowd needs to keep in mind. Symptoms of botulism include double or blurred vision, drooping eyelids, slurred speech, difficulty swallowing, dry mouth and muscle weakness that moves down the body. • Sell by Used primarily so the retailer will know when to pull the product from the shelf. Although you should buy the product before the "sell by" date, it will still be edible beyond this date as long as it was stored properly. For example, milk might lose quality after the "sell by" date, but it should still be good 7 days past the date. • Best before Self explanatory. The product will be at its peak quality and taste until this date. "Best before" has nothing to do with the safety of the product and you do not need to purchase the product by this date. 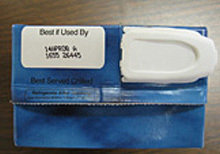 • Use by According to the manufacturer of the product, this is the last date that the product will be at peak quality. Once again, it has nothing to do with safety. • Expiration The last date the product should be consumed. It's the manufacturer's way of saying, "use past this date and you're on your own." • Born On Created by Anheuser-Busch and now used on their larger brands. "We use "Born On" date coding and a 110-day shelf life for our major brands, including Budweiser, Bud Light, Budweiser Select, Busch and Natural Light," said Peter Kraemer, Vice President of Supply at Anheuser-Busch. "The 'Born On' date is the exact day the beer was packaged and helps ensure great tasting beer." "For month coding, if a number is used, numbers 1 through 9 represent January through September, and letters O for October, N for November and D for December. If letters are used, A=Jan. and L=Dec., unless otherwise noted. Note: For year coding, 8=1998; 9=1999; 0=2000; 1=2001; 2=2002, etc. Oh, in the case of my late-night meal, I decided to go ahead and microwave the dinner despite its questionable age. Just to be safe I cooked it far longer than required and burned it to an inedible concrete crisp. I went to bed hungry, but the dinner did make a good bone for my dog. How much food do you waste, discarding after the best-by date?